The LIFE Oroklini project was officially completed on 31 December 2014. Planting local trees and shrubs. Creation of a pedestrian crossing at the main road adjacent to the site to ensure the safety of visitors. Moreover, all foreseen awareness raising actions were completed. 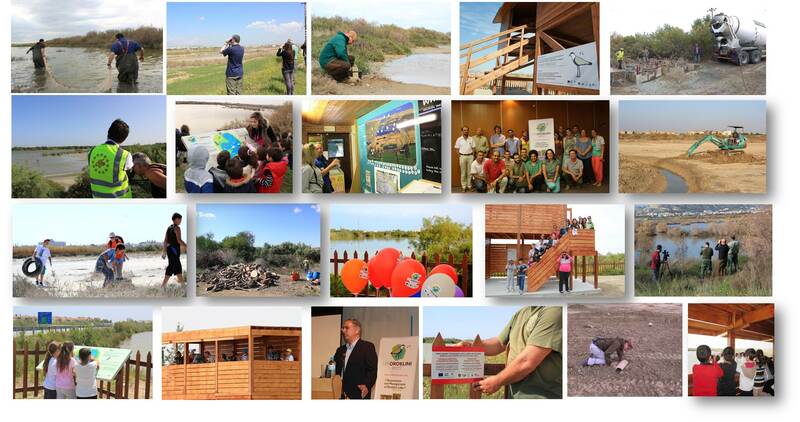 Oroklini Lake now has a birdwatching hide and an Information Kiosk, notice boards in three points around the site, photo album with photos from the lake, a video, leaflet, sticker and an education pack for schools. A volunteer clean-up day also took place with great success in October 2013 with over 170 participants. In 2013, nesting Spur-winged Lapwing (SPA designation species) and Stone-curlew (Birds Directive Annex I species) were recorded on the restored field. In 2014 (preliminary record as breeding season is still in progress) we recorded at least 2 Kentish Plover nests, while last breeding record of this species was in 2007! In 2014, Cattle Egrets nested in Oroklini for the first time. So far, we have recorded around 35 nests (preliminary record as breeding season is still in progress). In winter 2014, we recorded one of the largest winter flocks of Spur-winged Lapwing ever recorded at the site and this number has been the highest on the island for the 3-year project duration. On nesting islets created as part of the project Spur-winged Lapwings have successfully nested. The project’s success is also evident from the public’s engagement and support throughout project implementation. Since the start of the project in January 2012, around 1000 pupils had the opportunity to gain knowledge on Oroklini Lake and its birds through talks and experiential activities at the lake. Other groups have also shown interest and have visited Oroklini Lake to experience birdwatching. The Information Kiosk erected in February 2014 as part of the project has been an attraction for the public and our estimations show that around 100 people are visiting the site every month. Through this project Oroklini Lake has transformed in an area where the public can visit and enjoy nature. To read a brief presentation of the project (layman's report) please click here. To view project's progress in an action per action table please click here.